Review: Ken Loach's "I, Daniel Blake"
The vicious harassment of the sick and unemployed by the Tory government in Britain provoked legendary director Ken Loach, now 80 years of age, to come out of retirement to make one more film. And what a film! 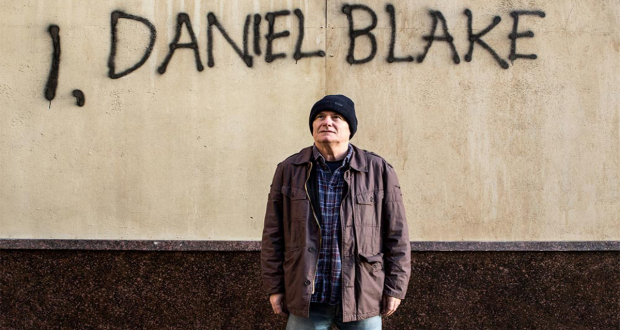 ‘I, Daniel Blake’ tells the story of the eponymous character, a carpenter in his late fifties in Newcastle who has a heart attack and is advised by his GP and specialist to take extended time off work. When he goes about trying to claim the UK equivalent of sickness benefit he is subject to one-size-fits all tick box survey at the hands of a private firm to whom the Tories have outsourced, about his physical capabilities by somebody with no medical qualifications. He ‘fails’ this test and is deemed fit to work and is driven to fruitless CV courses and job searches on pain of having his benefits cut. In the course of this ordeal he makes the acquaintance of Katie, a young lone parent from London, who along with her two children had no alternative to move north in order to escape homeless hostel accommodation in the capital, being unable to afford the rents being demanded there. The film pulls no punches on the impact of how the unemployed and sick are abused by the system and pushed to the edge. A particular scene in a foodbank is harrowing. Interestingly the right wing press in Britain have derided the film as somehow sensationalist but the research that went into Loach’s long time collaborator Paul Laverty’s script is peerless and the PCS union which organises in the UK Department of Worker and Pensions is credited with provided the information making the plot credible. The objections of right wing film reviewers says more about their disconnect from the reality faced by millions of poor, unemployed and sick people in Britain than it does about the quality of Loach’s film making. The main positive in the film is the portrayal of solidarity and kindness among people at the bottom of the heap up against the system including Daniel’s neighbour, the food bank volunteers, and one worker in the welfare office who tries to genuinely help him and is clearly at odds with the prevailing contempt people are held in by the more senior staff. Loach delivers again a film of outstanding social commentary. It has won the prestigious Palme D’Or at the Cannes film festival and achieved second place in the box offices in the UK in its first week which is more of a testament to social media and word of mouth recommendations than blockbuster style promotions. The mass viewing of this film has to also been seen in the light of the movement that has emerged around Jeremy Corbyn. Incidentally, Corbyn participates in an on camera promotion of the film. Of his past work “Cathy Come Home”, a film made for BBC in 1966 stands out as having had a real impact in addressing homelessness. Loach’s clearly expressed hope is that this film will likewise have a societal impact and galvanise opposition to the Tories and their war on the poor. Elements of what is portrayed in the film are creeping in to the system here in Ireland including outsourcing to a private firm called Seetec which pushes people into unsuitable training and job searches on pain of having your dole cut. The programme for government here also includes a so called “fit to work” programme which is the same name given to the regime in Britain where medically unqualified people can overrule doctors and specialists in terms of deeming people fit to work. Some 14,000 people have died within a short time frame of being ruled fit to work in Britain. We have to nip this in the bud and Leo Varadkar should be forced to watch this film and defend his Department’s use of Seetec. Anti-worker, anti-union: What’s behind the chaos in Ryanair?